This woven designed necklace is truly elegant and nice. This is substantial piece of high quality. It is well designed and polished silver shines greatly. Also, it is important to mention that it has very large lobster clasp which makes it easy to put on! I am very satisfied with this product and I am looking forward to any future jewelry made by this company. Beautifully done piece of jewelry that looks like it costs more than it does! Well made and crafted necklace. My wife will be wearing this more often than not and most assuredly when attending formal events. Great item that gets complemented by all when worn! I bought this necklace for my daughter and found it to be a beautiful piece of jewelry. I am sure she will like it. Very nice necklace, bought it for our daughter who adores this type of necklace. Will be a Christmas gift. This necklace was a gift from my mother in law. I opened it Christmas Eve. I can’t begin to tell you how beautiful it is. I put it on immediately. It looks gorgeous on also. You can tell it will last me a lifetime. The Argento Byzantine Necklace is an impeccable work of art with a price unmatched by any in its class. Italy has produced some of the world’s greatest masterpieces. And, it’s no secret it is the epicenter of the best metalworking on earth. Which is why we sought out one the best artisans to ever melt precious metals to create yet another great Italian masterpiece. For over two decades, our designer has pursued his passion for making jewelry of great beauty inspired by the Tuscan countryside. The Argento Necklace is his latest masterpiece. 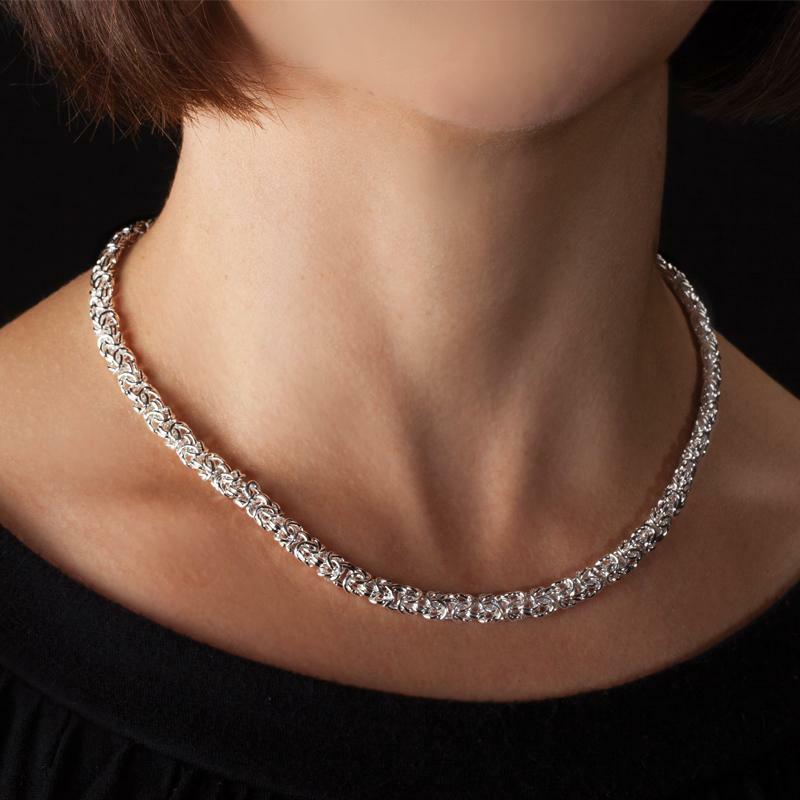 Each necklace is meticulously made by hand from pure sterling silver and celebrates the traditional woven Byzantine design–– an intricate array of woven links that forms a flexible and elegant drape. 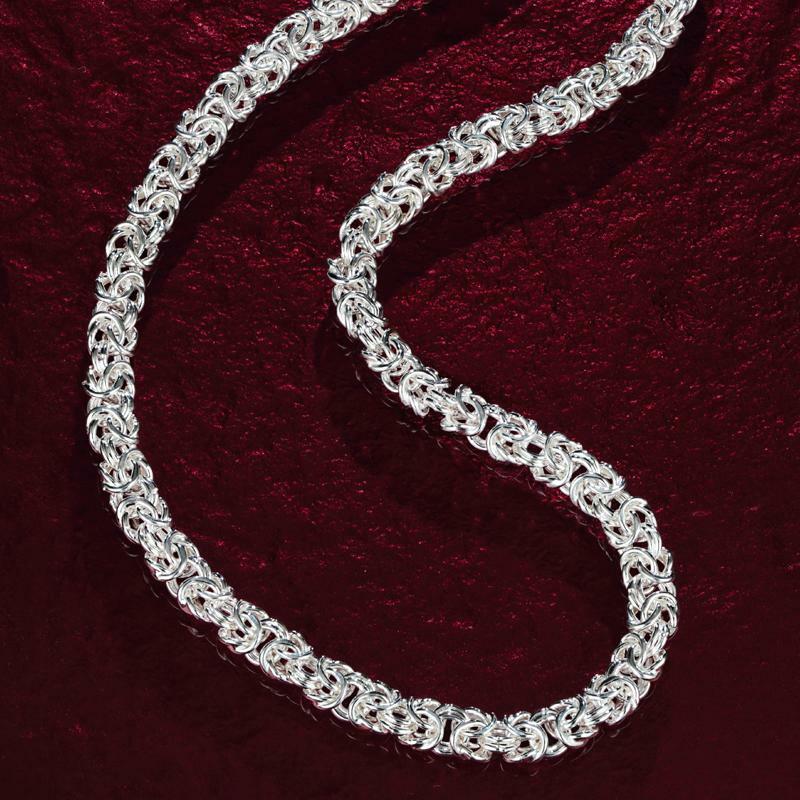 Passing the test of time and surpassing the definition of beauty, the Argento Byzantine Necklace is perfect for the lady who appreciates fine art. And, priced for those who appreciate a fine value. The difference between priceless & overpriced. High-end design should not carry a high price just because it comes from a big name retailer, where you’ll find a similar necklace going for four times as much. We prefer to keep our costs low so we can bring you the very best in Italian design at a cutting edge price. Masterpiece, not mass produced. It takes months to create just one of these necklaces which means we have a select number available.